Healthcare 2009: A Scramble for Answers? Experts spell out the issues that will be on everyone’s agenda. As 2008 slides into history books, what promises to be a watershed year in healthcare begins to take shape under the guidance of a new administration. Whether 2008 was viewed as progressive and successful or stagnant and disheartening, the fact remains that the industry is forging ahead with new challenges, new opportunities, and several unknowns. Judging from early returns, it appears that HIT will be a priority of President-Elect Barack Obama, who in a press conference on his budget strategy, said HIT should be one of the approaches used to help stimulate the economy. Helping local hospitals and healthcare providers invest in IT would provide “an immediate boost to the economy” and lay the groundwork for long-term economic growth, Obama said. In June 2008, the first Coordinated Federal Health Information Technology Strategic Plan was implemented by the ONC to lay the groundwork for initiatives through 2012. Kolodner says the strategic plan was an objective articulation of what will need to happen to continue to build the foundation for the interoperable architecture of the nationwide health information network. “While there may be differences in how we approach this agenda in the way of Democrat vs. Republican, this plan still forms the basis of what we need to do,” he says. The much-anticipated move toward a new coding system was announced last August in a move designed to replace the ICD-9-CM system that has been in use for more than 30 years. 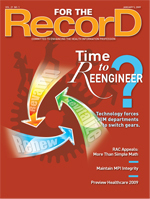 As coding and HIM professionals begin the process of reengineering systems across healthcare organizations, they will still be faced with the ongoing tasks of managing a hybrid system of health records and defining what constitutes the legal record (ie, being able to reconstruct a record from various points of entry, knowing what information is out there, and knowing how to find it). Experts suggest that ongoing challenges and opportunities, such as recovery audit contractor (RAC) audits, Medicare severity diagnosis-related group concerns, and speech recognition, will remain a focal point for healthcare organizations going forward. Add to that an intensified focus on cutting costs and increasing efficiencies, and most insiders agree that the role of the HIM professional will continue to evolve in an increasingly complex environment. According to Amy Hodges, CPC, CPC-I, director of content development for Bloodhound Technologies, coding can expect increased scrutiny via the RAC program and present-on-admission indicators, especially as laid out in the Office of Inspector General’s (OIG) Work Plan for fiscal year 2009. “Coders need to be aware of what is in the RAC contracts, and they also need to be on top of the OIG work plan,” she says. Kolodner says there are two main goals being mapped out in the ONC strategic plan for HIT: one having to do with patient-focused healthcare and the other focused on population growth. The report defines patient-focused healthcare as that which enables the transformation to higher quality, more cost-efficient healthcare through electronic health information access and use by care providers, patients, and designees. Population health is defined as the appropriate, authorized, and timely access and use of electronic health information to benefit public health, biomedical research, quality improvement, and emergency preparedness. “It’s first and foremost about the health and well-being of patients and communities,” says Kolodner, who points out that each of the main goals has four objectives: privacy and security, interoperability, adoption, and collaborative governance, with specific tasks and deadlines developed to promote and achieve those objectives. Kolodner says EHRs and personal health records will continue to be the key technologies over the next several years that will enable the electronic transformation in healthcare. “This [incoming] administration and Congress do see that HIT is a necessary piece for health reform to take place,” he says, adding that 2008 paved the way for real gains in 2009, including the first set of health information exchanges (HIEs) that will share real data in real time through the nationwide health information network. “This year, as opposed to the first couple of years of digging the foundation, things will start to peek above the hole,” says Kolodner. And while HIT adoption among physicians has shown only modest gains (from 10% in 2005 to 14% in 2007), Kolodner expects to see more significant increases. “That curve will continue to go up,” he says, despite the current sizable gap between the adoption rates of large entities and their smaller counterparts. In the current plan for HIT architecture, Kolodner notes that the anticipated outcomes will allow authorized access to comprehensive individual health information for patient care, consumer self-management, and a wide range of research, quality, emergency response, and public health initiatives. Beyond these tools, it will require health information networks to support secure and reliable information exchange within and across communities. While database-centric EHR systems have been making inroads across healthcare, one of the puzzle’s missing pieces has been a standard for the creation and use of documents across networks. CDA4CDT is designed to address this interoperability challenge. Developed by speech recognition vendor M*Modal, the AHIMA, and the AHDI, the project develops CDA implementation guides for common types of electronic healthcare documents, including history and physical, progress notes, discharge summaries, operative reports, and consults. The standardization and adoption of these electronic documents are expected to enlarge and improve the flow of data into the EHR and speed the development of interoperable clinical document repositories for use within regional and national networks. It will also keep doctors’ “narratives” useable and portable in an EHR environment, which becomes a challenge as the process becomes more of a “point-and-click” scenario, according to Bryan. “One of the biggest potentials of [CDA4CDT] is to bring compromise between HIT and clinicians,” she says. While many tout the promise of HIT efforts on the national level, Paul Ruflin, a long-term industry veteran in the technology sector and the current president and chief operating officer of Noteworthy Medical Systems, expresses doubt that the HIE movement will progress fast enough in 2009 to satisfy the agenda of many hospital CEOs. Experts agree that the announcement to adopt and implement the new, more advanced ICD-10 coding system by October 1, 2011, will likely have everyone scrambling to get prepared as best they can in 2009. With the system having already been adopted by a number of countries, including Canada, the United Kingdom, Germany, and France, many industry experts believe the United States is in a position of playing catch-up. Most healthcare professionals agree that the move toward ICD-10 will enhance healthcare delivery, but the implementation process does not come without concerns. With increasing pressures on healthcare organizations to make substantial investments in IT infrastructure, some of them, including the American Academy of Professional Coders and the AHIMA, believe the time frame for implementation is unrealistic, especially in light of dwindling resources. While 2009 promises to hold many new opportunities and challenges for HIM, industry professionals also point to a continued focus on many ongoing initiatives. Fuller points out that the focus on having a strong handle on financial recovery will provide opportunities for HIM to further step up to the plate. “At the end of the day, things tied to revenue will take center stage, as will the continued evolution of the EHR,” she says.